It was that creative side of the interpretive process that Plude and Quist captured so effectively in their Inside Mavericks presentation. Avivo is a fantastic team of teaching artists – excellent musicians and educational visionaries who live in the very fertile place where inspiration, craft, and self-expression meet. This mindset permeates their work as teachers, mentors, and consultants, serving as a powerful model to those who engage their services. A unique blend of mastery and playfulness, the Avivo approach creates a rich environment for musical and personal growth. Junior Composers places the greatest value on confidence-building and well-rounded musicianship training for all of our composers. The teachers at Avivo use creativity, performance, improvisation and full-body engagement as the quickest way for students to become leading musical citizens. We plan to partner with Avivo in the coming years as we train our composition faculty and music teachers throughout the Upper Midwest! I have had the privilege of working with the Avivo faculty in a variety of contexts. As a participant in The Walden School Teacher Training Institute, I enjoyed well-designed lessons, stellar teaching techniques, and the opportunity to stretch myself as a musician and teacher. As the director of a teacher professional development program that engaged several of these master teachers, I enjoyed warm, collegial relationships and watched them work effectively with over 100 general education classroom teachers, helping them master a range of musical skills that translated into music-enriched classrooms for hundreds of students in under-served communities. And as the coordinator of the San Francisco Symphony’s American Mavericks Festival, I witnessed a normally passive preconcert audience follow a complicated compositional structure, sing tone clusters, and create a “Happening” – all of which received rave reviews from both participants and the press. Avivo is a rich resource for musicians of all ages and stages, led by an incredible team of experienced, innovative master teachers. My work with these mentor teachers over many years has filled in gaps in my training, helped me connect the dots of understanding, and inspired me to develop a new way of listening, understanding, and appreciating music. Under their guidance I learned using my hands, voice, eyes, and ears, through a process of total immersion in the language of music. This integrated approach was powerful and completely engaging; it has changed the way I make music and transformed my teaching. The Avivo approach to music pedagogy and improvisation is completely effective and thoroughly indispensable for the contemporary educator and performer of music. For me, it was the glue that brought together years of fragmented educational concepts and performance practices. I strongly recommend that all educators, performers, and lifelong students of music learn about and engage in this exciting and joyful approach to learning music. I would not be the musician and teacher I am today if I had not learned so much from this wonderful group of musicians and educators. Under their teaching I learned all I know about music– reading, writing and improvisational skills, and strategies to teach these skills that I continue to use in my classroom today. The method I learned and use to teach is effective and creative, and shares a breadth of knowledge and depth of passion that still inspires me. …At the end of this totally interactive session, I was more energized mentally and physically than I have been at a pedagogical event for years. I went thinking I was going to learn more about helping students with composition, and returned with dozens of ideas for helping my students be better musicians and for restructuring my theory groups. And none of this came from being lectured to. We were a dozen people playing together, learning together and enjoying ourselves immensely. Every time I work with Pat Plude I am impressed with her thoughtfulness, dedication, and creativity. She has led workshops for us in which her authentically playful, inquisitive approach has met our unique needs, moved us forward, and broadened our inquiries. These experiences are so important to the work that we do. Avivo is a huge resource for music teachers and education organizations. I am so glad this group of people is sharing their expertise with the musical world through Avivo! They are a smart, creative, caring, and fun-loving bunch, and they are able to help any music teacher (whatever his/her age or situation) enhance their teaching through musicianship skill-development and creative approaches to pedagogy. I was fortunate to spend two week-long workshops with this crew. Highly recommended! I am invigorated and inspired through my experiences with Avivo Teaching Artists. The standard college music theory and aural skills curricula can bog one down in technicalities, and students sometimes lose the childlike joy that led them to music in the first place. Avivo’s approach to music and music education brought me back to my classroom with a renewed feeling of excitement and purpose, and my students have responded with increased engagement and creativity. This workshop reinvigorated me and has given me so many new ideas to try with my students. During my tenure with the music department at Santa Clara University, I have had the chance to witness the Avivo philosophy of teaching in action through the work of my colleagues Pam Quist, Patricia Plude, and, most recently, Bill Stevens, who currently directs our Musicianship program. These teachers embody their mission of making music education a lively and fun experience for all, while exhibiting high standards of rigor and effectiveness in the classroom; students learn… a lot! I have witnessed through their collective work a seemingly inexhaustible diversity of creative teaching activities as well as the capacity to engage each and every student, irrespective of their background and experience. The teaching artists of Avivo are my life-long mentors. I use their teachings in every facet of my career as a composer, teacher, conductor and administrator. Their holistic approach to music making and music education, one in which all sides of the musician are carefully nurtured, is truly unique in today’s music pedagogy. I have had the great good fortune of experiencing the Avivo music teaching philosophy as a child, colleague, and parent. In my own childhood musical learning, instruction from Pam Quist, Pat Plude, and Leo Wanenchak instilled in me a groundedness in musicianship that has carried me through to adulthood, where I perform as an amateur and feel a strong and abiding identity as a musician. As a teacher educator and professional developer, I have witnessed firsthand Avivo teachers’ deep pedagogical commitments to making musical education playful, creative, and responsive to learners’ developmental needs. And as a parent, there was no question that I would entrust my son’s musical education to Leo Wanenchak, who teaches so much more than how to play the piano: my son is learning about relationships among sounds and rhythms, about how musical compositions are constructed, and perhaps most importantly about how to think and feel music holistically, through mind and body and heart. Everyone ought to learn music this way. I have had the privilege of attending classes with several teaching artists at Avivo and have been inspired by their dedication and expertise. I have known Pam Quist and Pat Plude for many years and have long admired them as educators. They provide the most supportive, encouraging space for learning and teach in creative ways that challenge you and help you discover your own voice. I have grown tremendously as a musician under the teaching and guidance of Jazz Musicianship instructor Bill Stevens. Bill fluently blends theory and practice, listening and improvisation, keyboarding and ear training, all while customizing his expectations and instruction for each student’s experience and ability level. I give Bill’s curriculum, teaching methods, publications, and ideas primary credit when I teach jazz musicianship to my own private studio students, and I am grateful for his ongoing support and encouragement to experiment with and think about the keyboard in new ways. The teaching artists of Avivo embody what pedagogy is all about: inspiring and bringing forth the unique musical and creative spirit in each of us. Working with mentors from Avivo has deepened my musicianship as a teacher and a composer/improviser, providing me with a framework to continue developing my skills for the rest of my life. Their genuine enthusiasm and the desire they have to bring forth the creative musician in each and every person is deeply inspiring. I know of no other group that motivates each individual to grow from within quite the way they do. For the past several summers, Tom Lopez and Pat Plude have worked with the Master of Music Teaching students at the Oberlin Conservatory of Music. Having observed their creative teaching methods and the students’ final products, I can attest that Tom and Pat’s pedagogy is founded on creating communities of learners, play theory, and the innate exploration of the creative, musical self. Theirs is one of holistic learning of aural skills, music theory, and improvisation/composition. Tom and Pat are experienced, empathetic educators who are poised to bring these pedagogical principles of music and education to Avivo. Tom and Pat hold high standards for the students and themselves, and they recognize the profession’s need for this type of innovative project. Musicians become teachers, not only in schools and communities, but also as ensemble members, chamber musicians, and solo performers. Avivo’s mission has aligned itself with national and state music standards, while engaging students in hands-on, constructivist learning. Tom and Pat are “on to something” big! I am excited to recommend Avivo teaching artists and their creative approach to musicianship. The techniques I learned from them help my college theory students gain a much deeper understanding of musical concepts, since they must use not only their powers of recall but also employ their knowledge to make new pieces of musical art. I am also completely amazed at how their approach has helped me become a much more sensitive musician and discover my own compositional abilities. It has been truly a pleasure for me to discover new musical ways of understanding and new talents along the way. My teaching, online education, and community building skills have been greatly influenced by Tom Lopez and all the Avivo mentors. Their collective experience and insights as educators and entrepreneurs are unique. I especially appreciate the example Tom sets as a passionate, hard-working musician and educator, and I am grateful for his ongoing support. When participating in a class with Pat Plude, I found myself challenged and engaged in new ways of music-making and thought. The sequence she used and the materials were exceptionally well chosen for the experience she was providing. It was great fun and enlightening! 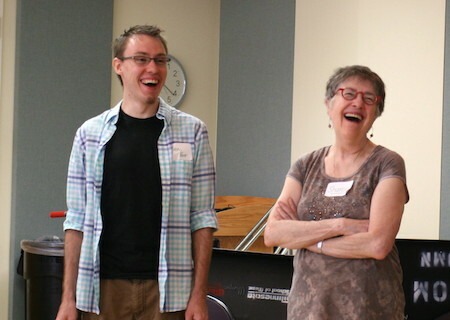 Our Master of Music in Teaching (MMT) students, many of whom also completed undergraduate performance degrees at Oberlin, have said that their work with Tom and Pat was the most exciting musical experience they ever had. I believe this is due to the creative and improvisational work Tom and Pat offer. From my experience years ago in a summer program with Pat Plude and Tom Lopez, I know their work has served the ‘test of time’ and they have a special approach to leading students in developing their musicianship. This opens new avenues for students to reconsider how they teach and perform.